The mobile phone giant, Apple, is recognized as the most versatile mobile phone manufacturing company in the world and has been patronized by billion of users, across the world. The Newer concept, design, technology, look are some of the fascinating issues, which made this company the most popular and the front runner in this segment of business. Since the inception, Apple, under the guidance and leadership of Steve Jobs and even after his sad demise; the company is having the most inspiring growth rate, which is really an issue of great value. Apple was trying since 2013 to develop a foldable mobile phone device, which could be the breakthrough in the entire mobile segment and helpful for the company to gain a formidable market share. 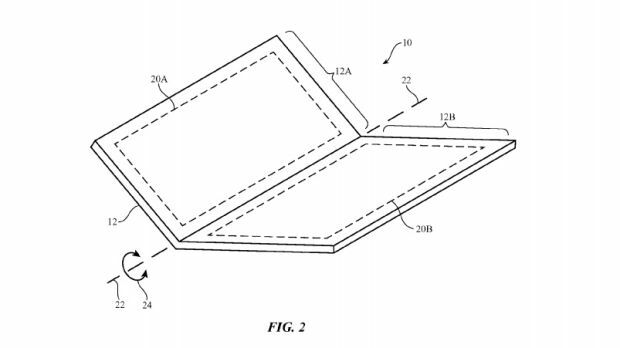 Now after three years, the company is awarded a new patent, which confirms the rumor about the company of development of foldable mobile phone, a reality now. Although, company, like Samsung, is also trying to develop such a device for past few years, but till date, they are not been able to get the breakthrough. It can be noted that the filing was done, for the patent, on August 28, 2016, but the award is been given only now. Though the rumors were there in the market for the last few years that some of the leading manufacturers, including Apple and Samsung, are trying to develop the foldable mobile phone and a tough fight was going on amongst these developers to get the feat of the pioneer in this unique segment. The most interesting part of the foldable iPhone is the precise description of materials, those are being used in the future manufacturing; glass, fibre, ceramic, plastic or aluminum, which are the premium in nature and not very different from the ongoing trend of the manufacturing process.